Browne expects a bloody good fight for fans on Saturday. 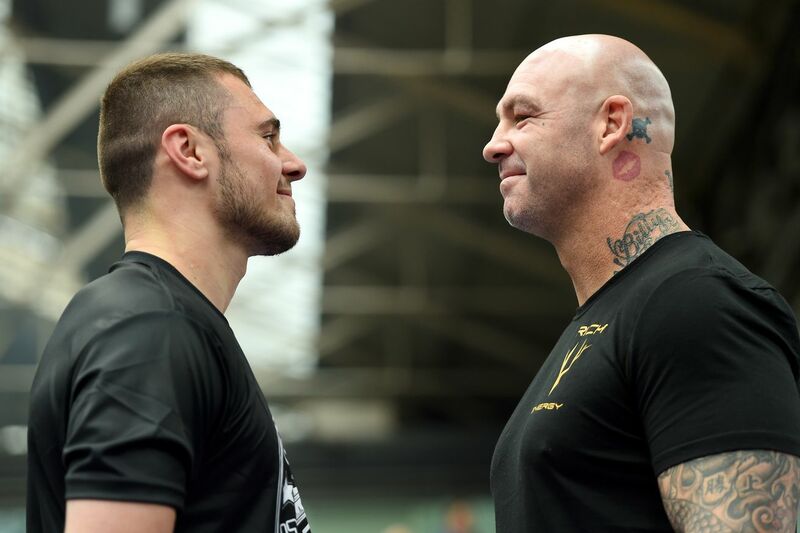 Lucas Browne, the former WBA “world” heavyweight titleholder, is set to face Dave Allen this Saturday in London, live on DAZN, and for this fight, there’s no attempt to sell bad blood. The two met up at a public workout, and Browne (28-1, 24 KO) said he understood why Allen (16-4-2, 13 KO) has become a fan favorite. That said, the 40-year-old “Big Daddy” from Australia isn’t planning to take it easy against the 27-year-old Allen, and expects this to be a good fight for fans. “I don’t think he’s ever going to be a world champion but he’s definitely a great fighter,” Browne said. “If you put him up against anyone else in Australia, I think he beats them. He’s got a chin like a brick so it’s going to be a long night for me. I’m not going to bowl him over in one round but I’m prepared for all scenarios. We’re going to knock lumps off each other. Browne hasn’t faced a serious opponent since he was thrashed and knocked out by Dillian Whyte in March 2018, and while he’s won three straight, there’s further reason for concern: he last fought on March 2 on a small show in Scotland, and he was dropped in the second round by Kamil Sokolowski (6-15-2, 3 KO), surviving to win on a score of 57-56 over six rounds. It wasn’t his best showing, to say the very least, but Browne says he feels good going into this fight. “I’m hooked up with Jay Gray, my head coach,” he said. “I’m in Perth with my kids and family and that’s a full time thing there. Jay does everything in the one gym so not only my boxing, sparring and pad work, but all of the strength and conditioning, fitness and everything all in one spot.